(Challengers of the Fantastic#1(fb)) - At some point, the villains known as Multi-Master, Diablo the Volcano Man, Drabny the Fixer, the Radioactive Kra, and Ultivac the Multi-Robot decided to pool their resources in an attempt to defeat their common enemies -- the Challengers of the Fantastic. (Challengers of the Fantastic#1(fb)) - Multi-Master, along with his creation, Ultivac the Multi-Robot, nearly destroyed the Challengers of the Fantastic (although it is unclear if Multi-Master and Ultivac the Multi-Robot were collaborating with the other Challenger Haters of Evil at the time). (Challengers of the Fantastic#1 (fb)) - In an altercation with Diablo the Volcano Man, Challengers of the Fantastic member Ben "Rocky" Grimm accidentally caused June Masters (the estranged daughter of Multi-Master) to permanently lose her eyesight (although it is unclear if Diablo the Volcano Man was collaborating with the other Challenger Haters of Evil at the time). (Challengers of the Fantastic#1 (bts)) - The Challenger Haters of Evil all died by the time the original CHALLENGERS OF THE FANTASTIC series came to an end, although it was implied that they would not stay dead indefinitely. In case you're confused, Amalgam Comics didn't really exist beyond those seen in the few DC/Marvel cross-over. The titles you don't recognize are amalgams of similar Marvel and DC comics--Snood. Special thanks to writer Karl Kesel and editor Tom Brevoort for clarifying some of the component sources for their amalgamated characters and providing some additional insight into the Amalgam Universe! The father of honorary Challenger June Masters, the villain known as Multi-Master was a foe of the Challengers of the Fantastic. Skilled in robotics, Multi-Master created Ultivac the Multi-Robot to assist him in his efforts to defeat the Challengers of the Fantastic. A member of the Challenger Haters of Evil, Multi-Master and Ultivac the Multi-Robot were nearly successful in destroying the Challengers of the Fantastic. Although Multi-Master was seemingly killed in the original CHALLENGERS OF THE FANTASTIC series, editor Tom Brevoort suggested that Multi-Master would be making a comeback in CHALLENGERS OF THE FANTASTIC (vol. II). Multi-Master is an amalgam of Puppet Master (Philip Masters) of the Marvel Universe and Multi-Man (Duncan Pramble) of the DC Universe. An enemy of the Challengers of the Fantastic, Diablo the Volcano Man was battling Ben "Rocky" Grimm when the hero accidentally caused June Masters to permanently lose her eyesight. A member of the Challenger Haters of Evil, Diablo the Volcano Man was seemingly killed in the original CHALLENGERS OF THE FANTASTIC series -- but editor Tom Brevoort suggested that Diablo the Volcano Man would be making a comeback in CHALLENGERS OF THE FANTASTIC (vol. II). Diablo the Volcano Man is an amalgam of Diablo (Esteban Corazon de Ablo) of the Marvel Universe and Volcano Man of the DC Universe. A member of the Challengers Haters of Evil, Drabny the Fixer was seemingly killed in the original CHALLENGERS OF THE FANTASTIC series -- but editor Tom Brevoort suggested that Drabny the Fixer would be making a comeback in CHALLENGERS OF THE FANTASTIC (vol. II). Drabny the Fixer is an amalgam of the Fixer (Paul Norbert Ebersol) of the Marvel Universe and Drabny of the DC Universe. A member of the Challengers Haters of Evil, the Radioactive Kra was seemingly killed in the original CHALLENGERS OF THE FANTASTIC series -- but editor Tom Brevoort suggested that the Radioactive Kra would be making a comeback in CHALLENGERS OF THE FANTASTIC (vol. II). The Radioactive Kra is an amalgam of Radioactive Man (Dr. Chen Lu) of the Marvel Universe and Kra (King of the Living Robots) of the DC Universe. 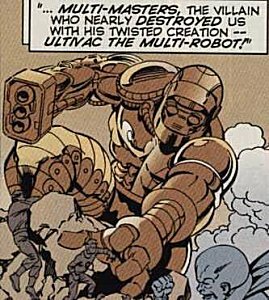 Created by the villain Multi-Master, Ultivac the Multi-Robot was actually an amalgam of four different robot bodies, each with its own unique capability. A member of the Challengers Haters of Evil, Ultivac the Multi-Robot and his creator were nearly successful in destroying the Challengers of the Fantastic. Although Ultivac the Multi-Robot was seemingly destroyed in the original CHALLENGERS OF THE FANTASTIC series, editor Tom Brevoort suggested that Multi-Master would be making a comeback in CHALLENGERS OF THE FANTASTIC (vol. II). 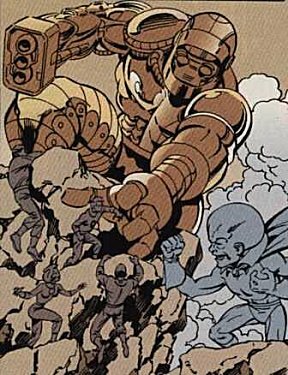 Ultivac the Multi-Robot is an amalgam of the Destroyer, Galactus' Punisher Robot, and Machine Man (X-51) of the Marvel Universe with Ultivac and Ultra the Multi-Alien (Ace Arn) of the DC Universe. -- Writer Karl Kesel revealed that Amalgam's Ultivac the Multi-Robot was like DC's Ultra the Multi-Alien (whose body was comprised of four alien beings, each with an individual ability) -- only that Ultivac the Multi-Robot was comprised of different robots rather than alien beings. 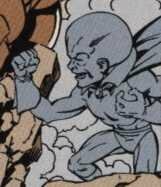 His head was from Ultivac of the DC Universe, the sentient robot and Challenger of the Unknown foe who eventually became a member of the Forgotten Villains. His upper left side was from Machine Man of the Marvel Universe, a rogue government mobile weapons system and ally of the Avengers. His upper right side was from the Punisher Robot of the Marvel Universe, Galactus' mechanical servant. His lower right side was from the Destroyer of the Marvel Universe, an enchanted construct created by Odin. His lower left side was of unknown origin. All characters mentioned or pictured are  and © 1941-2099 Marvel Characters, Inc or DC Comics. All Rights Reserved. If you like this stuff, you should check out the real thing!